Want to hear about German Shepherd Rogue? 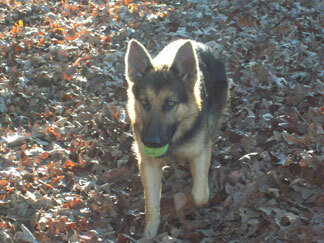 Here is a story about one of our readers German Shepherds - a GSD named Rogue. Read on to hear what the owner has to say about this wonderful German Shepherd. This is Rogue. A 2 year young gsd. She was the most scared dog i've ever seen when i first got her. She was terrified of people and anything that moved.She is now a loving family dog who wont leave my side. She is a true hero. While 4-wheeling in the woods she was made to stay at the house. i flipped the 4 wheeler over on my leg and couldnt get it off. Not only did she find me but she brought help as well. It's funny how dog's develop that bond with some one and just seem to know what to do and actually get it done. Thanks so much for sharing the story of your German Shepherd Dog Rogue with us. It's so nice to hear about all our readers dogs and especially how the dogs transitioned over time from maybe a scared dog, as in this case, to a more confident and loving family companion. Your dog Rogue looks to be every bit the image of what a GSD should be and it is so nice to hear how she has grown into more of what you would typically expect as far as how a German Shepherd Dog would act around its family. And heroic acts like these, where the dog actually finds a family member in need - that is so cool to hear though, thank goodness, not very uncommon. These dogs often create strong bonds with their owner and tales of bravery like yours do happen quite a bit.